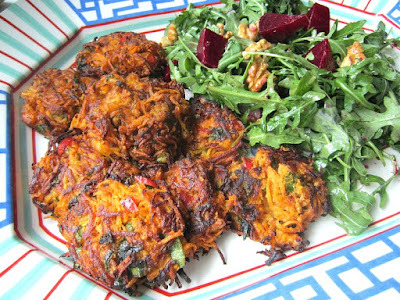 Here is a new twist on sweet potato pancakes (latkes)......with the addition of shrimp! 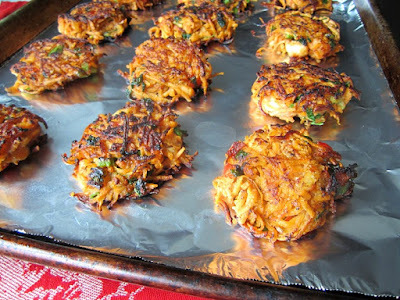 They are like my shrimp cakes, but use no breadcrumbs.....lots of protein and good stuff inside, but I will hear groans from the people who are afraid of frying. To fry or to bake? that is the question. I tried baking these, but they just taste better fried. Sorry. I made a double batch and froze some, and then reheated them in the oven, and they were great. Delicious with avocado salsa, or hot sauce. 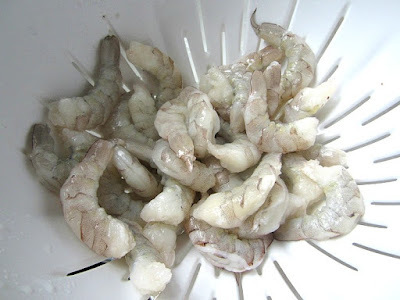 Start by pureeing 2/3 of the shrimp in a food processor to make a paste. Chop the other 1/3 of the remaining shrimp. 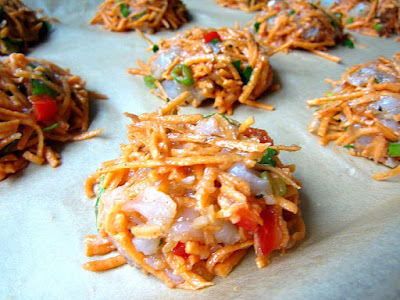 Add the shrimp, grated sweet potato and the rest of the ingredients and mix together well, so the mixture is nice and moist. Form into patties and lay on a baking sheet until ready to fry. I like to keep mine in the fridge for a few hours, so they get nice and firm. 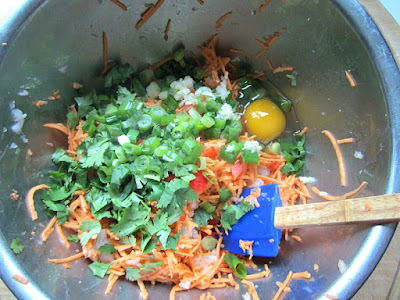 When ready to fry, heat a layer of vegetable oil in your biggest nonstick skillet and cook for 2-3 minutes on each side. These freeze well, wrapped in foil and stored in ziplocs. Yeah! Gluten free. I will make this yummy recipe! Thanks. I was lazy, and put the grater attachment on my food processor bowl, grated the sweet potato, then I minced the shrimp with the regular blade! I hate cleaning the food processor, but it was so much easier this way.